Previewed at: Entertainment Quarter, Moore Park, Sydney, on 11 June 2017. Ba-na-naaa! The Minions are back! The latest in the Despicable… series, Despicable Me 3 is a rollicking roller-coaster ride voiced by an illustrious cast that includes Steve Carell, Kirsten Wiig, Julie Andrews, Steve Coogan, Russell Brand and Trey Parker. The story kick-starts when Gru (voiced by Steve Carell) is informed that he has a twin brother Dru (also Carell) and he sets off with Lucy (Kirsten Wiig) and the girls, Margo, Edith and Agnes, to meet his more successful sibling. Dru lives in a flash mansion and owns his own jet, speed-boat and a host of other ‘toys’ but is desperate to learn the family trade of ‘villainy’ from his brother. He wants to buddy up to steal the massive Pyramid of Giza diamond that’s been recently ‘acquired’ by Gru’s nemesis, Balthazar Bratt (Trey Parker), who’s obsessively trying to re-invigorate the fame of his ‘80s TV character (somewhat hilariously, he ‘channels’ Michael Jackson). 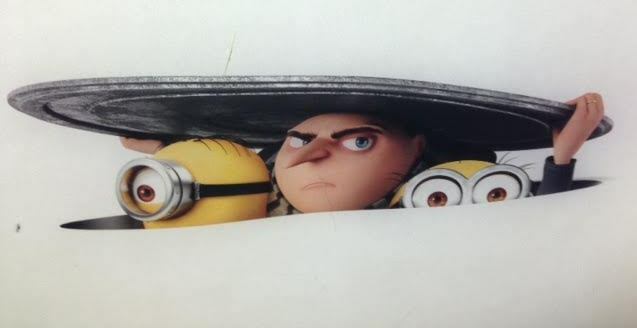 However, there’s a bit of a problem because, as we know from Despicable Me, Gru has given up his dastardly ways and it takes some convincing to get him to join the heist. ​Meanwhile the Minions, disgusted with Gru’s ‘life of no crime’, have given up on him and rebelled, joining ranks under the leadership of Minion Mel (co-director Pierre Coffin, who also voices the other Minions). There’s much mayhem and fast action and a real ‘aaaw’ factor when Agnes (Nev Scharrel) befriends a ‘unicorn’ which is actually a goat. Despicable Me 3 is a fun family treat and a guilty pleasure for big kids as well. No doubt there’ll be many more to come before the Minions reach their use-by-date.